It’s the Town of Parry Sound sign and tax levy special edition. For the most part there is little to note about the meeting that requires much public reflection. The Tax Rates for 2017 will be formally approved (10.5.1), I offer a few comments in that section of this post. The Downtown Business Association levy is also being approved (10.5.2). The Town is tidying up sign permits (9.2.1, 9.2.2, 9.2.3) and re-establishing a Façade Improvement Committee (9.2.4, 9.2.5). I do note that there is not a closed meeting of Council this week, which is a bit of a surprise. Note that there are plans for a Strategic Plan review on May 30th(8.3). I suggest you be there to understand what Council is planning, and ask questions. It’s my sense that Council has a number of things they are working on that they are not sharing with the public. My request for information on the purpose of the purchase of two pieces of property by the Town were refused on the basis of confidentiality. It’s our money they are working with. Perhaps they are taking some cues from what has been going on south of the border. Why bother to be transparent when there is nothing the public can do beyond complain. Or can they? 2.1.1 – Council will hold a public meeting to consider two proposed Zoning By-law amendments under Section 34 of the Planning Act.The purpose of the first proposed Zoning By-law amendment is with respect to a vacant lot known as 24 Addie Street, or Lot 12, north side of Addie Street, Plan 89 in the Town of Parry Sound. The applicant has requested relief from the Residential Second Density Zone to reduce the minimum lot area from 300 square metres to 253 square metres for each semi-detached unit, reduce the required rear yard setback from 10.5 metres to 5.5 metres, permit an additional 0.5 metre projection for the front staircase and increase the maximum lot coverage from 30% to 35.9%. 2.1.2 – The purpose of the second proposed Zoning By-law amendment is with respect to 11 Salt Dock Road, or as part of Lot 20, Concession A and part of the original road allowance between Concession A and 2, formerly Township of McDougall, now in the Town of Parry Sound, and Part of Parcel J, Registered Plan 137, more particularly described as part of Parts 1, 2 and 3, Plan 42R-19106 located on the north side of Salt Dock Road. The applicant has requested to amend the Special Provision 26.73 zone which would have the effect of permitting an additional eight units on the entirety of the property (previously permitted 84 units between three buildings, now requesting 92 units between three buildings). The existing height restriction of 16.5 metres and all other requirements of the R3 zone shall continue to apply as per the current Special Provision zone restrictions. 8.3 – Notice of Special Meeting of Council. That Council call a Special Council Meeting for May 30th at 6:00 p.m. to review and prioritize the Strategic Plan. g) All other regulations in the sign by-law continue to apply except for those revised by this resolution. 9.2.4 – Façade Improvement Program Committee – Terms of Reference. Resolution. That Council adopt the Façade Improvement Program Committee – Terms of Reference per the attached Schedule “A”. 9.2.5 – Appointments to the Façade Improvement Committee. Resolution. That Council appoint Anne Bossart, Alex Distler and Kathy Dyer to the Façade Improvement Program Committee. 9.3.1 – EMS Power Cot purchase. Resolution. That upon the recommendation of the EMS Advisory Committee the Town of Parry Sound authorizes the expenditure of 56,748.00 +HST to Stryker EMS for the supply of three Power Stretchers. 10.3.1 – Renewal of lease for the Seguin EMS base. By-law 2017 – 6734. Being a By-law to authorize the execution of an agreement with The Corporation of The Township of Seguin for the leasing of a portion of Foley Fire Stn. #2 located at 18 McKaig Road. 10.5.1 – Striking tax rates for fiscal year 2017. By-law 2017 – 6735. Being a bylaw to Strike the Tax Rates for Municipal Purposes for the Year 2017. Here are the tax rates and tax levies for 2017 including the Education Rate. Be nice to our local businesses, especially Commercial, they are carrying a proportionately much heavier portion of the education costs. I’ll provide a quick comparison of Town of Parry Sound and The Township of Seguin 2017 Tax Rates in a separate post. 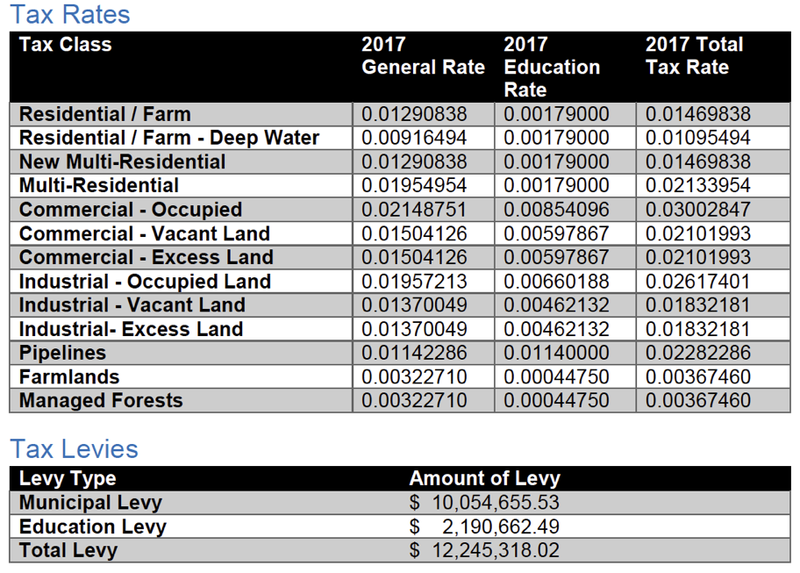 The levy for 2017 is the same as 2016, $67,000. Despite this the DBA assessment tax rate is going up by 4.9% to account for the drop in the 2016 MPAC Commercial Property reassessment. The net/net should be about the same for Downtown businesses in terms of their out of pocket cost to support the DBA. 10.5.3 – Refinancing Smelter Wharf Loan. By-law 2017 – 6737. Being a By-law to authorize the borrowing of funds between the Bank of Nova Scotia and the Corporation of the Town of Parry Sound for the Smelter Wharf Port. The Town purchased the Smelter Wharf in 2007 from the Canadian Government with a loan from the CIBC. It’s time to refinance the loan and i/staff is recommending a five-year loan from the Scotia Bank for an amount of about $350,000 at a 2.67% interest rate. I have business out of town this coming week and won’t be able to attend. But I should be able to catch up on the meeting with the newly introduced online streaming of Town of Parry Sound council meetings. We’ll see, literally and figuratively.